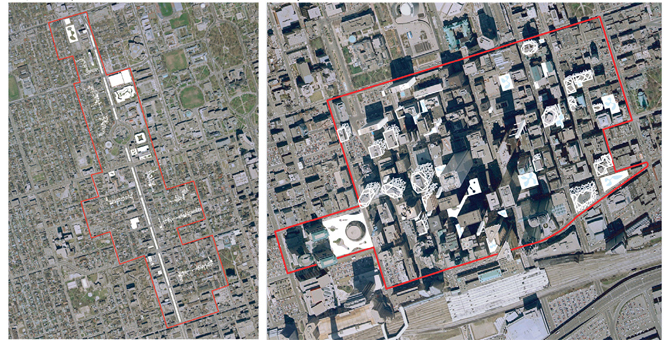 Responding to the individualization caused by globlalization, this research developed new housing types using “left-over” sites in downtown Toronto as means to densify the city. The project breaks down the density by sprinkling a much finer grain into the city instead of adding chunk volumes to form a new field which is organized without hierarchy. By turning the streetcar lane on Spadina Avenue into a green tunnel with openings allowing sunlight and views to penetrate, this project adds houses with different shapes and dimensions on the lane and use the barriers to accommodate their at-grade entrances. This project also explores how a variety of units is possible on such a constricted site and scenarios are developed. In this project, located in a collective mat on top of the U of T athletic center, the units gain independency due to their round shape and being separated from each other by the enlarged in-between space, which forms a continuous flow surrounding these bubbles replacing conventional corridors. With their different sizes and configurations of interior space and gardens, the units respond to various life styles. This project is a pair of experiments on the blank sidewalls of two tall slabs to test opposite ideas about differentiation and individuality. In the first one the new housing is a thin layer negotiated with added common facilities to form a folded external wall. The second one is a volume with smooth external surface and the variety is resulted from the carving out of four gardens. The spacious laneway and backyards of the deep residential blocks in Toronto is an important resource with great potential. Negotiating with lot-owners in the block results in buildable sites of different sizes, proportions and locations. The variety of units comes from this process. The units are connected by a corridor and given a face on city streets. Thus they are both collective and distributed. We propose a roof to this outdoor court to make it viable in all weather conditions. The roof holds one-story housing units, and four yards. Instead of punching holes to give sunlight to the space below, we opt for a mat a floor made of glass blocks and skylights to the units to create a diffused light effect in the space below. Seen from there, the building looks like a piece of cloud; From above, the roof evokes a manicured landscape complete with a reflecting pond rolling grass mounds. Thin towers tend to be inefficient due to the large elevator cores. One possible solution is to connect the thin tower to its adjacent buildings. To reduce the number of bridges needed, the new tower is made of several groups of walk-up units accessed from a garden. Since the tower is close to its adjacent buildings, we introduced two zones in each unit to lead in sunlight and view as well as protecting their privacy. Glass-clad high-rise buildings provide opportunities of intensification. We propose to ‘clad’ the existing office tower with a new layer of housing that strategically climbs up the building , capitalizing on existing infrastructures while providing for new means of expansion and densification. A great diversity of unit sizes and configurations is another interesting result of this innovation.